"The NAP-Cities is an opportunity to unite in addressing a key issue since it is present in the challenges of all institutions," Daniel Freitas, National Director of Territorial Planning, speaking at the Sustainable Cities event in Uruguay in October 2018. 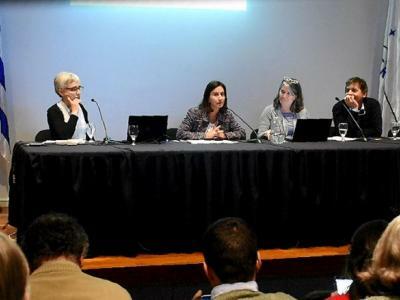 16 October 2018, Uruguay - The National Adaptation Plan for Cities and Local Governments project (NAP-Cities) presented on progress and anticipated challenges for the next few months at a Sustainable Cities event on October 11 in Uruguay. The event brought together the National Territorial Organization Committee, comprised of institutions related to urban planning and development from around the nation, with the Second NAP-Cities Working Session, a collection of representatives from the National System of Response to Climate Change (SNRCC), the Advisory Commission on Land Management (COAOT), the Uruguayan Agency for International Cooperation (AUCI) and the United Nations Development Programme (UNDP). The opening round table discussion was led by Undersecretary of the Ministry of Housing, Territorial Planning and Environment (MOVTMA) Jorge Rucks, National Director of Territorial Planning José Freitas and National Water Director Daniel Greif. Rucks highlighted the challenge presented by urban sustainability for MVOTMA, UNDP and various stakeholders at the national and local levels. "As an issue that encompasses 93 percent of the country's population, what is done in our cities impacts the whole nation,” Rucks said. National Water Director Daniel Greif stressed the importance of water planning at the urban level and noted that climate change is an opportunity to review all aspects of sustainability in cities and think about the problems in an integrated manner. At the closing of the opening discussion, National Director of Territorial Planning Daniel Freitas emphasized, "the NAP-Cities is an opportunity to unite in addressing a key issue since it is present in the challenges of all institutions." Mariana Kasprzyk, from the Climate Change Division of MVOTMA, Myrna Campoleoni, principal project consultant, and Gustavo Olveyra, technical consultant, presented the progress made by the NAP-Cities. After addressing unilateral and multilateral responses to climate change (through the Kyoto Protocol, Paris Agreement and National Climate Change Policy, among others), Kasprzyk outlined the national adaptation plans foreseen in Uruguay. The NAP-Cities is one of the three NAP plans that set goals for 2020 (along with the Agricultural NAP and the Coastal NAP). Adaptation plans related to energy and health are expected to be implemented by 2025. Myrna Campoleoni gave an overview of the main concepts linked to climate change and variability, as well their causes and main consequences in urban areas. She noted that the sectors most exposed and sensitive to climate change and variability were the water and sewage systems, the power system, transportation and telecommunications, construction materials and recreation spaces, green infrastructure, ecosystem services, and social and health services. The NAP-Cities process, Campoleoni stressed, "is a continuous, progressive and iterative process that allows a country-level approach; it is transparent, participatory and gender sensitive, and takes into account vulnerable groups, communities and systems." The consultant also addressed issues such as urban vulnerability and resilience, expressing the need to "move from urban resilience to urban sustainability, integrating the concept of resilience in a crosscutting way to strategic planning, overcoming sectorial interests and permeating all areas of management." The NAP-Cities project is still undergoing consolidation since its launch in May. The meeting featured the presentation of the project’s main advances and lines of action. The technical team is in formation, NAP-Cities is in a diagnostic stage that includes the execution of an inventory and balance of urban adaptation planning, as well as an assessment of the existing gaps in information on climate change in cities, noted Gustavo Olveyra. In turn, the assessment entails evaluating the existing training needs required to implement adaptation in urban areas, and a survey and evaluation of the development plans in investment in cities to identify and evaluate risks related to climate change. Olveyra stressed that preparing the NAP involves multiple actors throughout the country, so one of the most important tasks was the assembly of a "system of actors," which would not just define the institutions involved at the national, departmental and local levels, but would also establish degrees of involvement, competencies and management capacities. Identifying institutional references and defining a process to systematize learning, review experiences and collect feedback will be one of the main challenges in the coming months. Implementing fluid communication between the complex web of actors associated with the issue, generating spaces for real participation and defining adequate training strategies constitute additional challenges that the project has proposed for the elaboration of an intersectional and interdisciplinary National Adaptation Plan for Cities and Local Governments to climate change.